The body works best when used as a whole, not as an isolated part. So, you will train to move your strength and energy up from the soles of your feet like a wave rising through your whole body. This course explores the deeper aspects of Chinese martial arts and Qigong: the secrets of the ancient masters! At the core are breathing techniques which unite mind, body, and energy to produce real and focused power. You all have the strength within you. True strength derives from the fascia, rather than the muscle. It needs strong intention and clear focus to lead it out. During this training, you will be staying in Nam Yang Kung Fu Retreat, All of the rooms are designed with serious Kung Fu students in mind. Every room has an inspiring mountain view from the front door and a roofed front terrace to sit in the shade and get the benefit of the views and the fresh mountain air. They are within the very easy walking distance of the training facilities and the restaurant. There are two types of rooms, either shared or private. Shared rooms hold two people. They are spacious, have separate bathrooms and toilet or washrooms, and are equipped with fans. They are arranged in two buildings, each with six rooms. The front terrace is two meters deep and serves as a social area where students can relax and chat outside of training time. The private rooms are designed for single occupancy. These rooms are finished to a high standard with tiled walls and thicker mattresses. Each "house" has two rooms which are completely separate. They are located slightly further away from the center of the retreat, which gives a quieter feel. Nam Yang also supplies communal tea and coffee making facilities and fridges. The kitchen, gardens, and orchards provide healthy, organic food which you collect and serve fresh. They specialize in growing herbs. Whilst they are not able to grow all of your own food, you support poor farmers in the hill tribe villages by buying food directly from them at market prices ensuring that they get a good income and you get the best quality food. This energy is Chi, or Qi, and is the foundation of a healthy body and healthy mind. Training in these ancient Chinese arts is a moving meditation in itself. It unites mind, body, and breath and is a great complement to yoga. Real wisdom is the realm of a calm and fully connected mind. You train your minds through your bodies and connect the creative with the analytic minds, the body-brain with the head brain, the conscious with the subconscious. There is philosophy in movement. Calm, steady flow. Patient and accurate. Flexible. Healthy ‘Chi’ is healthy energy. It is the foundation of a healthy body and healthy mind. It flows through the body guided by the mind. Mind-body and Chi (breath or energy) are inseparable and need to be trained together. This program uses a clever combination of physical movement, Chi cultivation, and meditation to draw together mind, body, and breath so as to complement and strengthen each other. It delivers mental calm and focus, physical health and fitness, strong, relaxed breathing and vigorous, well-balanced Chi. It is less strenuous than the Shaolin Warrior Program and is ideal for less aggressive people, less fit, or older people wanting to concentrate more on internal development raised consciousness and good health. It is also a great way for people with a yoga background to explore ancient Chinese exercise. The program covers five full days each week with Wednesdays and Saturdays reserved for rest, relaxation, and exploring the local area. 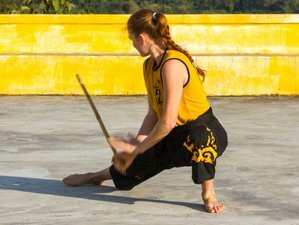 08:15 - 09:00 A concentrated lesson covering a different theme each day including Sum Chien, the original Shaolin internal power training, Kung Fu partner training for stability, strength, etc., joint locks and manipulations, combative drills, relaxation training, Qigong face massage, and meditation training. 11:00 - 13:15 Bodhidharma’s vein tendon Qigong. Vein Tendon Qigong and further practice of Sun Frost White Crane Tai Chi. Pushing hands: touch sensitivity exercise with a partner which develops connectedness, stability, grounding, and awareness. Sticky hands: touch sensitivity sparring: practice for high-speed close range fighting. Conditioning: physical toughening of the hands, wrists, and shins to properly take and deliver impact. Further meditation. 15:30 - 16:30 Deep stretching session. Beginning with a short physical warm up, this is a very intense stretching session with particular emphasis on hips and spine. It opens your meridians and releases bad energy, bad experiences, and bad emotions trapped in the fascia, especially around the hips. It is also great for improving posture which in turn completely transforms your dominant emotions and moods. 16:30 - 18:00 Weekly ‘masterclass’ an in-depth, technical session covering a different topic each week delivered by the most senior teacher present, usually Master Iain. Small group training in the Sun Frost White Crane Tai Chi including the cane (walking stick) routine. Further training in Sum Chien: the internal strength routine. Meditation. Either fighting application followed by pushing hands and sticky hands or Qigong breathing methods and chanting. 18:00 - 19:00 Dinner followed by free time. Early nights recommended. Shuang Yang training gently stretches and releases the body’s tendons in a slow rhythmic fashion, increasing its strength, and stimulating Chi to flow. Shuang Yang practice involves a great deal of flexing and twisting in the torso, as well as opening the meridians and energizing the tendons, which strengthens muscles which you do not usually use. It also wrings out and cleans the internal organs, pushes fluids along their course and manipulates the joints of the spine, keeping them moving freely to promote a healthy spine and body. Shuang Yang training is performed in a meditative state and is a genuine "meditation in motion". It requires sinking of the Chi, calming of the mind, and breathing from the core of the body. Regular practice greatly improves health, vitality, and combats aging. Usually referred to as "Shuang Yang" (sun frost) for short, this is the internal form of the white crane art. It is performed in a very soft, relaxed way, gently opening the Chi flow in the meridians, training elasticity into all of the tendons and massaging the internal organs. Whilst superficially very similar to normal Tai Chi, it is part of the Buddhist Shaolin tradition, rather than the Taoist Wutan tradition. Many people practice the Shuang Yang primarily to benefit their health, vitality, and longevity. Whilst the slow, gentle nature of the training make it ideal for older or less fit people. Make no mistake, this is a genuine martial art. Weight is sunk down and movement is generated from the core of the body, moving out to the limbs like a wave through water. Training connects all of the tendons in the body into one resilient, elastic network with incredible strength. All movements are performed with the whole body. You are vaguely aware of the great benefits of Qigong and meditation to health and longevity but do not really understand how it works. Here is an overview. Chi (or Qi) circulates around your bodies in a daily cycle, mainly but not entirely through pathways called meridians and vessels. Chi is stored in energy centers or reservoirs called Tan Tiens. The two main sources of Chi are the Earth (Yin Chi) and the sky (yang chi). When the Chi in your bodies is circulating freely and is balanced between yin and yang, you will enjoy a good health. Opening the meridians through stretching exercises and guiding Chi through them facilitates strong, smooth circulation of the Chi. Drawing in fresh Chi from the earth and sky keeps your Chi plentiful and allows you to balance yin and yang. Expelling stale or excess Chi keeps your Chi fresh and prevents it becoming excessively strong. By its nature, Qigong is simple and easy yet amazingly effective. Anyone can practice it successfully, regardless of age or fitness. The essential requirements are a properly trained instructor and good, fresh air. Vein Tendon Qigong is a simple but effective system which tones all of the fasciae in the body and increases its elasticity so that it can store energy. It is a straightforward system which emphasizes reverse abdominal breathing and therefore trains elasticity into the internal organs, energizing them and making them resilient to injury. Master Iain is a Kung Fu philosopher and author with 36 years of living Kung Fu. Trained personally by Grand Master Tan Soh Tin in Singapore, he’s a two-time world champion and veteran of real street battles. Famous for his high-quality Kung Fu teaching, his instructional films and magazine articles, and for his demonstrations of Iron Shirt Qigong, Master Iain is a mine of information but retains a very practical, down to earth, and realistic approach. Most people who meet him are struck by his air of calm, patience, and wisdom. Dave's initial success in Kung Fu drew from his experience as a karate teacher and a strong determination to constantly work hard to improve. He has a background in personal training and specializes in strength against body exercises. Dave became attracted to the Kung Fu Retreat as he wanted to get away from modern commercial martial arts and commit his life to the study of genuine Kung Fu. He further wants to explore the spiritual aspects of traditional Chinese martial arts and its associated culture. Dave is based full time at the Kung Fu Retreat. Michael is an enthusiastic teacher whilst at the same time maintaining a very relaxed attitude. He first came to the Kung Fu Retreat in 2015 and loved what he found so much that he returned home and worked hard until he had saved enough money to return and join the instructor training program. He intends in the future to open his own kung fu school. Although he has lived most of his life in the US Michael is originally from Guatemala and speaks Spanish as well as English. He is very interested in the history of Shaolin Kung Fu and Nam Yang Pugilistic Association. Emily is passionate about her kung fu training. She began training in Northern Shaolin Kung Fu in the USA which she enjoyed greatly but was attracted to Nam Yang because of the history and integrity of its arts. Rather than a mix of styles and routines what she found at the Kung Fu Retreat was a tightly connected system of internal kung fu, external kung fu and weapons supported by the practice several styles of chi kung and the study of Chinese philosophy, strategy and culture. She also values greatly the chance to train full time and dedicate herself fully to the arts which she studies. Thailand is a great country with a relaxed, happy positive vibe. This is why it is so popular with tourists. It is easy to travel to, easy to get around in, and easy to get by in English, unlike many countries in Asia! Very importantly, visas are easy to get. The Pai Valley is an area of incredible natural beauty. High in the mountains, it epitomizes the Kung Fu dream of training in pure, fresh air with awesome views well away from the distractions of modern life and the pollution of modern cities. It is easy to grow and prepare healthy, natural food in the farmland around Pai and this allows you to eat the sort of diet which best supports your training. The Nam Yang Mountain Kung Fu Retreat School is designed to be the ultimate martial arts training and meditation venue. It is set on 2.1 acres of land on the side of a mountain spur, bordering the jungle and maintaining awesome views across the Pai River valley to mountains rising steadily to the Himalayas. In the early morning, when you begin training, the mountains are usually shrouded in mist which gradually clears as the sun rises. The school is built in the local Shan style architecture according to Chinese Feng Shui principles. Thailand is a great country. It is one of the most popular destinations for international travelers. Thailand is close enough to Singapore that their top masters can travel easily. The North of Thailand has some of the very best chi in the world. It flows down from the Himalayas. This makes for a perfect place to practice Qigong and seriously boosts health and vitality. This was the primary reason for choosing the location of Nam Yang. The Pai Valley is an area of incredible natural beauty. High in the mountains, it epitomizes the Kung Fu dream of training in pure, fresh air with awesome views, away from the distractions of modern life and the pollution of modern cities. It is easy to grow and prepare healthy natural food in the farmland around Pai which allows you to eat the sort of diet supports on your training. Thailand is a fairly economical country in which to operate. It is not the cheapest in the world but is very cheap compared to western countries. The Pai District is popular with tourists because there are so many things to do. You will have two days off each week and have a fairly long break from training in the middle of the day. A stay at the mountain retreat can be a holiday as well as a training experience. Nam Yang Mountain Retreat is located in the foothills of the mountains overlooking the Pai River valley in the northern part of Mae Hong Son, Thailand’s remote North-Western province. Mae Hong Son translates as ‘the land of mist’. It is dominated by fairly high, forested mountains and is sparsely inhabited, mainly by Thailand’s famous hill tribes. Pai is the main tourist center in Mae Hong Son Province and ideally suited to receive and entertain foreigners. It has a population of about 3000 who, at peak times, are heavily outnumbered by tourists. Pai acts as a hub for activities and excursions, such as trekking, elephant riding, caving, ox cart riding, rafting, off-road driving or motorcycling, waterfalls, temples, and hill tribes. The favorite way to get around for most is to rent a small motorcycle for about 80 THB per day. It contains a multitude of bars and restaurants with very reasonable prices. There are many market stalls selling local food and goods, and shops selling any supplies you are really likely to need. As you would expect in Thailand, the town also boasts a number of beautiful Buddhist temples run by monks. For most of Nam Yang Kung Fu Retreat guests, the food is one of the highlights of their stay. Quality food is essential for martial artists in hard training. Nam Yang Kung Fu Retreat has their own kitchen garden, herb garden, and fruit trees all of which are entirely organic. Nam Yang Kung Fu Retreat is now partially self-sufficient for fruit and vegetables. What they don’t grow by themselves, they will choose carefully usually from the local farmers' market or from people they know well. The rice is bought from a rather remote hill tribe village in the mountains. By buying rice directly from poor ethnic minorities, they support their families. Nam Yang Kung Fu Retreat prepares local style food with an emphasis on the use of beneficial herbs to increase its value. Their diet is calculated to best support your Kung Fu training as they understand that you are what you eat. Food prepared on site is as fresh, organic, and healthy as possible and is usually delicious local Thai or Shan style, or occasionally Chinese or southern Thai style. Meals will start with one or two types of fruit and usually some salad. Nam Yang Kung Fu Retreat then typically serve two main dishes with rice. Most dishes are vegetarian but Nam Yang Kung Fu Retreat does serve meat. There will always be at least one vegan dish as part of each meal. Nam Yang Kung Fu Retreat will also try their best to cater for specialist diets. Nam Yang Kung Fu Retreat supply breakfast daily and evening meals on training days. Drinking water is supplied free with meals and is available from the kitchen free of charge at any time for resident students. They also serve specialist teas two to four times a day. Either high-quality Chinese tea, something integrally connected with Kung Fu training, or herbal tea for health benefits. The instructors eat in the dining area, together with the students, which is a testimony to the quality of the food and helps provide a good ethos for the school. Meal times are therefore ideal for discussing Kung Fu and asking questions. Almost any style of food can be purchased in Pai, (Italian, western, middle eastern, Chinese, Indian, and much more). The local diet is based mainly around rice, meat, fresh-water fish, vegetables, fruit, and spices. Kindly note that seafood is relatively expensive in the mountains. Local fruit and vegetables are great, fresh, and very cheap. Pai is a hub for adventure tourism. Most of the students hire a moped so as to get around and appreciate what the area has to offer. Moped hire is very cheap. Safety first is recommended when dealing with mopeds. There is a huge range of activities available locally. There is a masseuse available on call who specializes in traditional Thai massage, herb massage, and oil massage. The cost of the massage is 200 TBH per hour. Compared to prices in the West, this is ridiculously cheap! Please book your flight to arrive at Suvarnabhumi Airport (BKK) or Chiang Mai International Airport (CNX). Arriving at Chiang Mai is much nearer to the Kung Fu Retreat but Bangkok has more flights and is usually cheaper. Once in Bangkok, you can book a domestic flight to Chiang Mai. Once in Chiang Mai, take a minibus to Pai. Minibus trip costs about 200 THB and has awesome views. It takes about three and a half hours, most of which is spent on amazing winding roads through mountains. The views are breathtaking and the journey is an adventure. You are recommended to travel during daylight. The most popular minibus provider is AYA service. Their office in Chiang Mai is opposite the train station. Book on to the next available minibus if you have not booked already. Once you arrive in Bangkok, you can get an overnight sleeper train from Bangkok’s central station, Hua Lam Phong, for around 1000 THB each way. Booking in advance is recommended. Please be aware that trains in Thailand often run very late. The trains are very comfortable and afford great views of the Thai countryside. Minibuses run between about 7:30 a.m. and 5 p.m; If you arrive in Chiang Mai later than about 3:30 p.m, you are likely to need to either stay overnight in Chiang Mai or get a taxi to the Kung Fu Retreat. If staying overnight, which is the cheapest option, it is recommended that you still go to the AYA service office when you arrive and book a minibus for the next day. Then look for a guesthouse nearby. You should get a nice room with fan for 400 to 500 THB. Once in Chiang Mai, take the 25-minute flight to Pai. When you first arrive in Pai, the easiest way to get to Kung Fu Retreat is simply to book a taxi. The taxis are a little way up the main street from the AYA service office. A motorcycle is the cheapest taxi and should cost less than 100 Baht. For a minibus or taxi car, it will be 200 to 250 THB. For further information, please kindly to send Nam Yang Kung Fu Retreat an inquiry. A reservation requires a deposit of 50% of the total price. The rest of the payment should be paid on arrival. Nam Yang Kung Fu Retreat is a residential martial arts training offering Kung Fu for combat and self-defense, and Qigong and meditation for health. For this organizer you can guarantee your booking through BookMeditationRetreats.com. All major credit cards supported. I would like to receive the BookMeditationRetreats email newsletter, including special Meditation Retreats offers and giveaways. Show this Meditation Retreat to your friends.